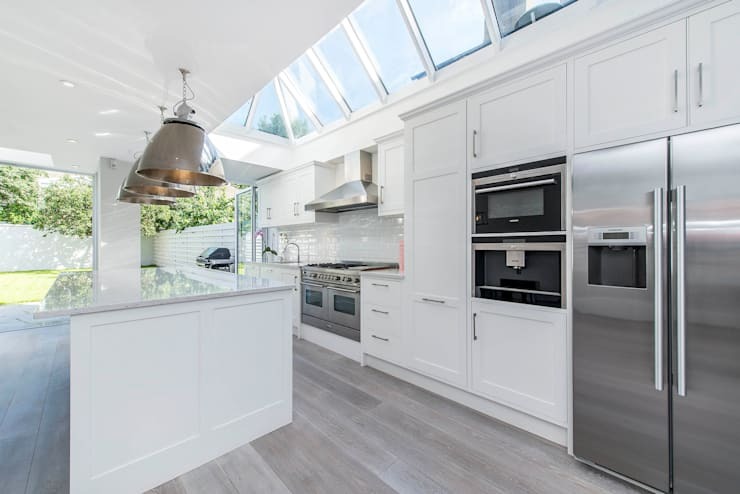 If you do choose a white kitchen, take inspiration from this one and flood the space with natural light, to really make the most of the dazzling colour! Black is the perfect contrast to white, so what about adding a black worktop? It will be far easier to keep clean as well as adding delicious style! 3. It can be practical. 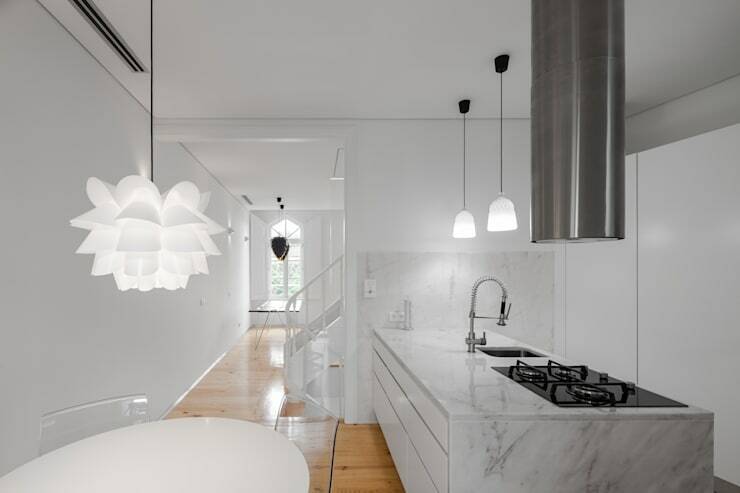 Who said that white isn't a practical choice for a kitchen? Not us, after seeing this delightful pantry cupboard! White always looks so clean and simple that these hidden storage solutions are such a surprise! 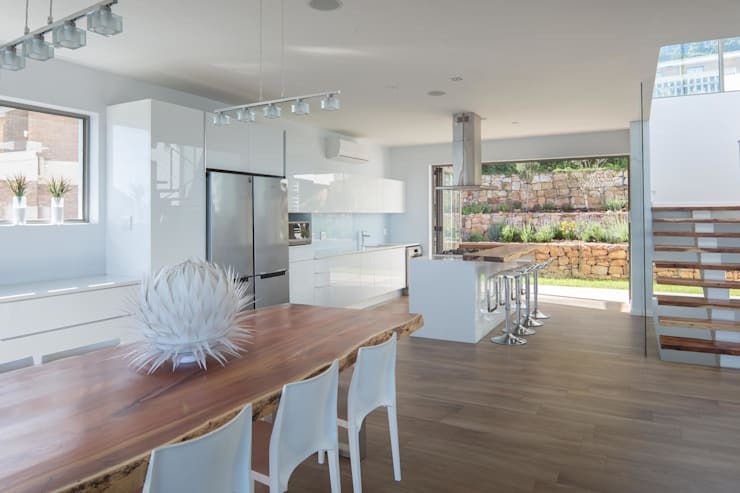 If you want to go as modern as possible with your kitchen then a white scheme is the perfect choice! It creates a super contemporary and almost futuristic space, with sleek lines and integrated handles. 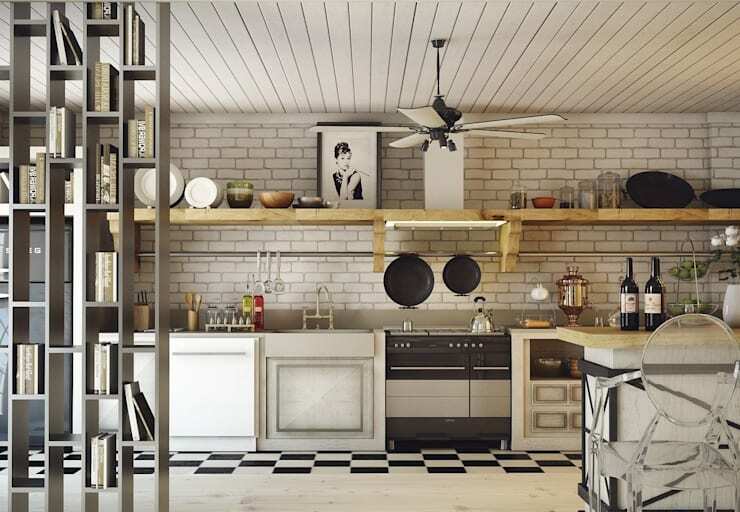 On the flip-side, white is also perfect for creating a country-style kitchen! What an adaptable colour! 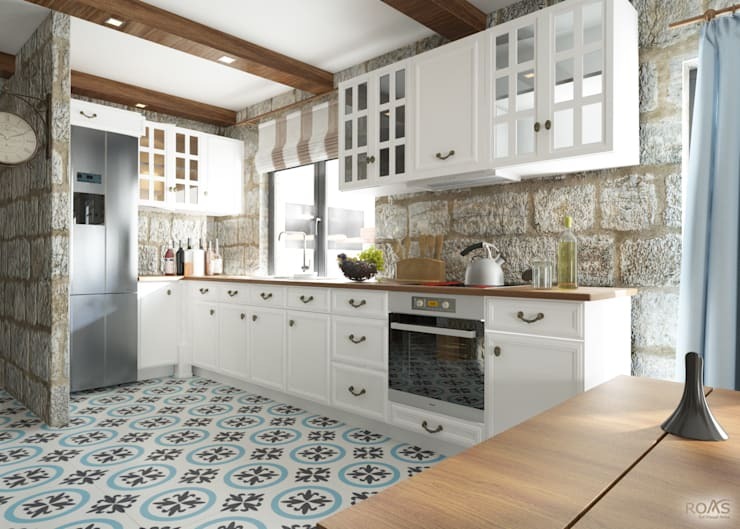 Add some rustic tiles and traditional handles and suddenly, you have the ideal rural kitchen. We love this kitchen, which feels modern and yet has traditional shaker cabinet doors. 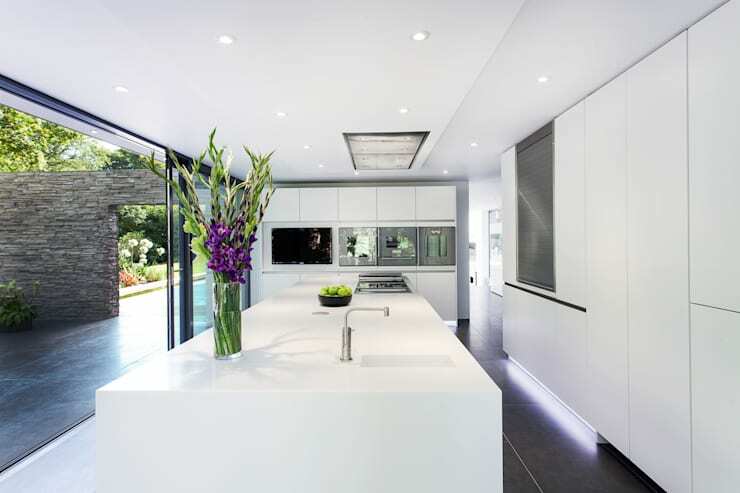 With a chunky black granite worktop, the contrast lends a contemporary touch to the bright white main structures! Now we know that white kitchens can be modern or traditional, it shouldn't come as a surprise that an eclectic edge is also possible! 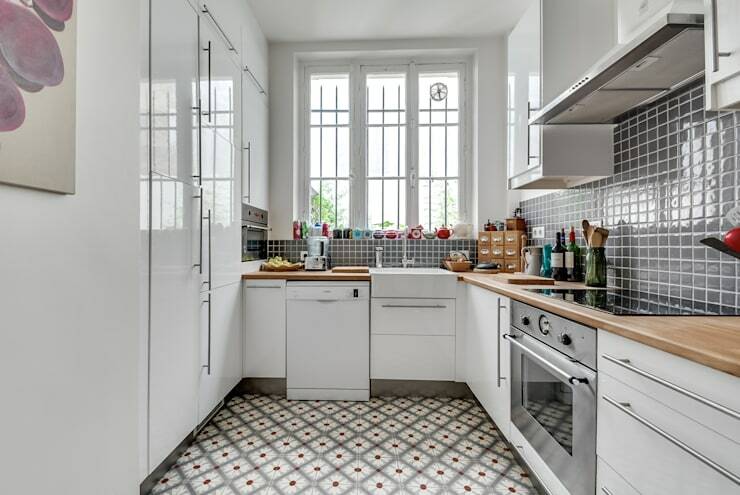 Simple white cabinets, with white subway tiles look amazing here, thanks to the darker grout and look funky! White and black look great, but if you want to take colour mixing to the next level, you need to think about white with GOLD! 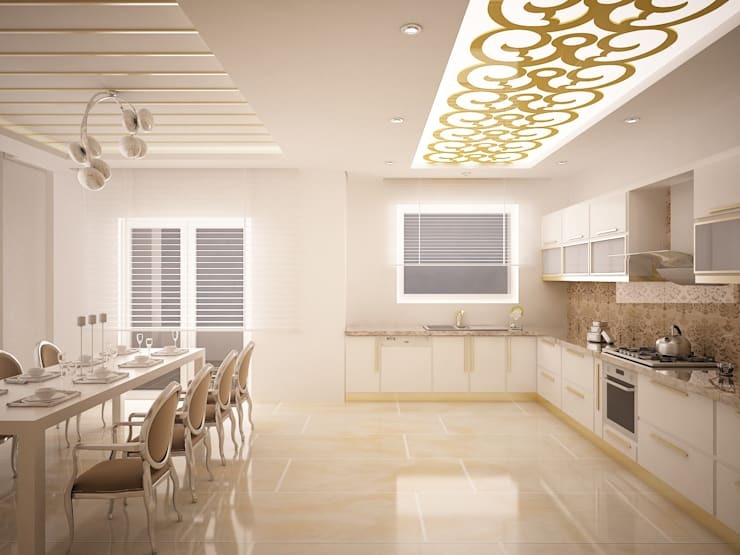 Regal, luxurious and eye-catching as anything you'll ever see, a glittering white and gold kitchen would be an amazing addition to your home. In a small kitchen space, a white kitchen is a natural choice, as it will keep the area looking and feeling as large as possible! Glass-front top cabinets are a great way to maximise the airy feeling too! White and wood work together perfectly and create a beautifully organic and warm kitchen space that feels welcoming and classic. Gloss doors and smooth wood are the perfect combination! If you want a kitchen with a difference, using white as your base colour is a fantastic idea, as it is the perfect neutral! Plus, it works well with any material and offers a beautiful aesthetic. 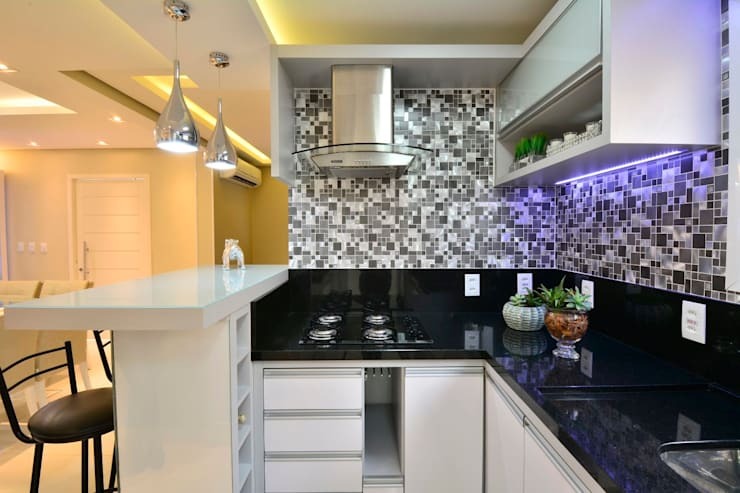 With a plain white set of cabinets, you can afford to go a little wilder with things such as floor and wall tiles, even if you have a tiny kitchen! With the bulk of the space finished in white, a little accent here and there won't shrink the space! 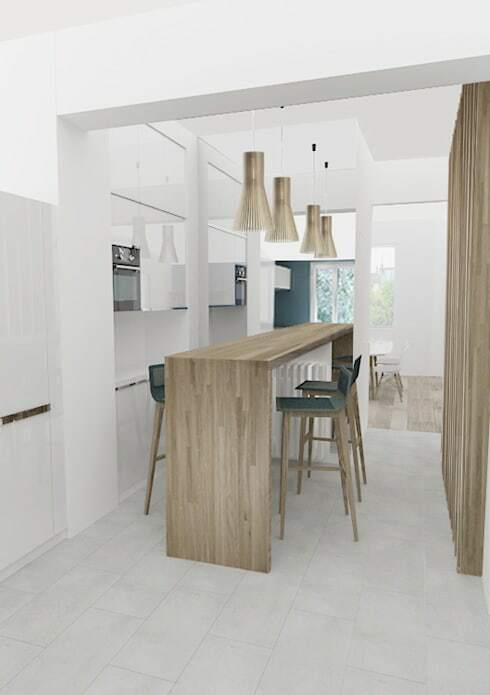 In modern home extensions that have been built specifically to house a new, larger kitchen, we think that plain white, smooth-fronted cabinets are the answer! Modern and beautiful, they really make the most of a new room! What a gorgeous kitchen! 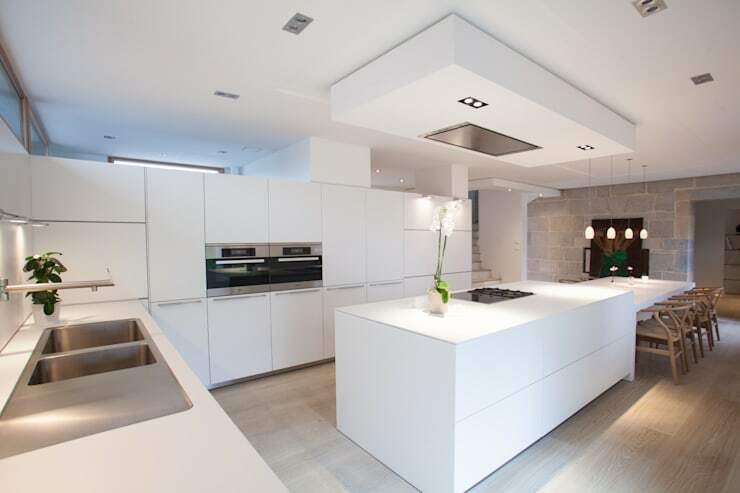 The white cabinets simply disappear into the walls and offer almost invisible storage on a grand scale! Breaking up the vast expanse of white with natural wood offers such a cosy aesthetic too! 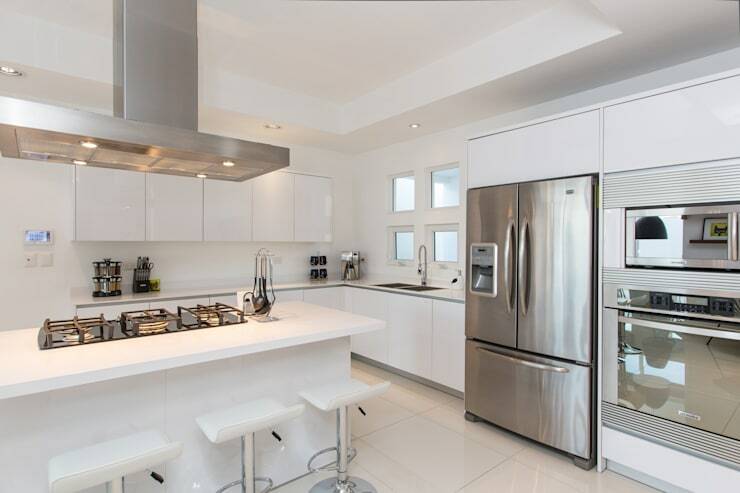 White is the only choice for a truly futuristic kitchen, as it pairs with brushed metal appliances so well! 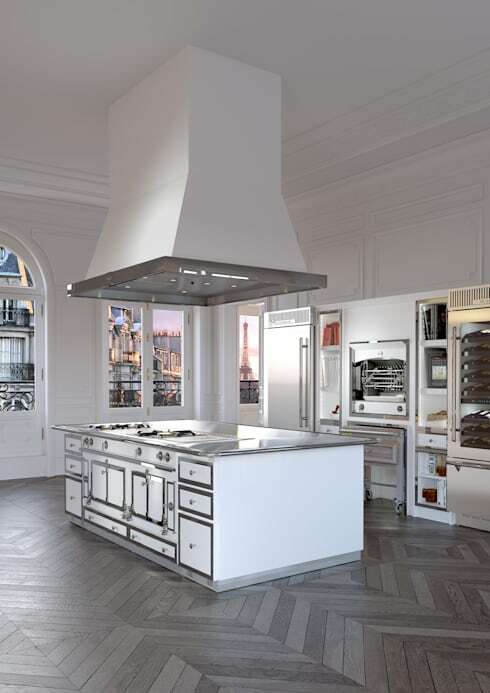 Keeping the white parts simple allows you to go a little more wild with the accessories, such as amazing extractors and eye-catching fridges! White is such a simple. fresh and clean colour, but it can also be the colour of opulence and luxury! 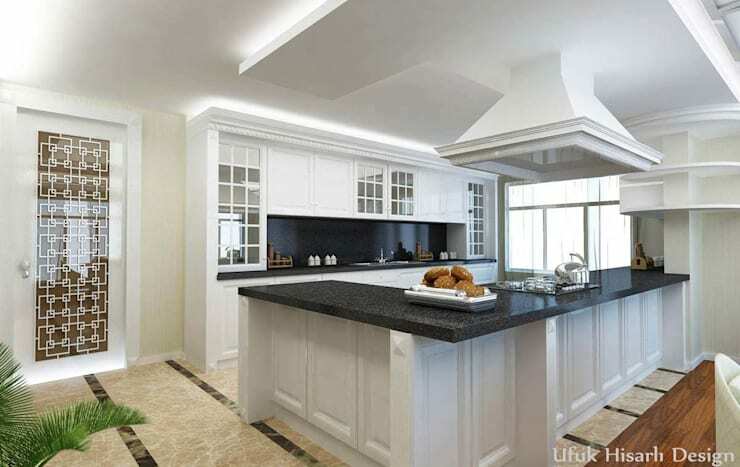 White marble makes for a truly stupendous kitchen that nobody will be able to forget, as you can clearly see here! 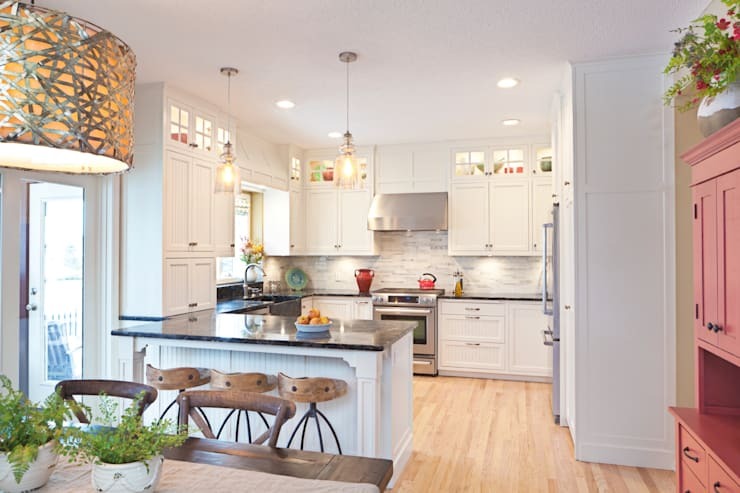 For more kitchen inspiration, take a look at this Ideabook: Kitchen makeovers: 5 jaw-dropping transformations. Are you a little more tempted by a white kitchen now?